These days, fully occupied with workshop renovation and extension, and with spring gardening activity. One item that can’t be missed in an allotment garden definitely is a BBQ. 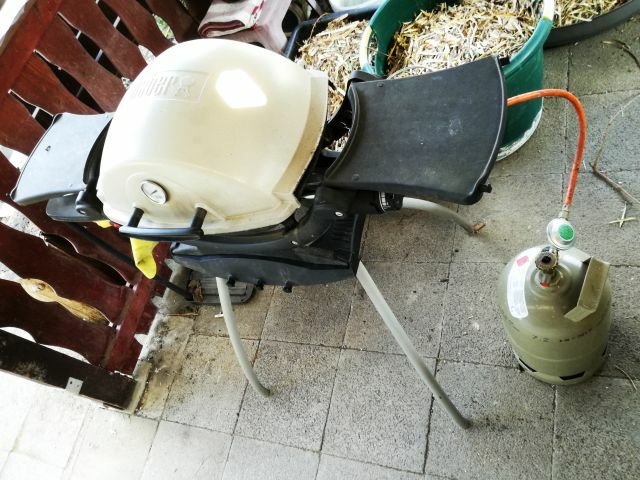 Well, there are 2 coal-fired BBQs already, why not add a (gas powered) Weber? Only downside, these come at a quite significant price tag, and most times we will be using the charcoal grills anyway. 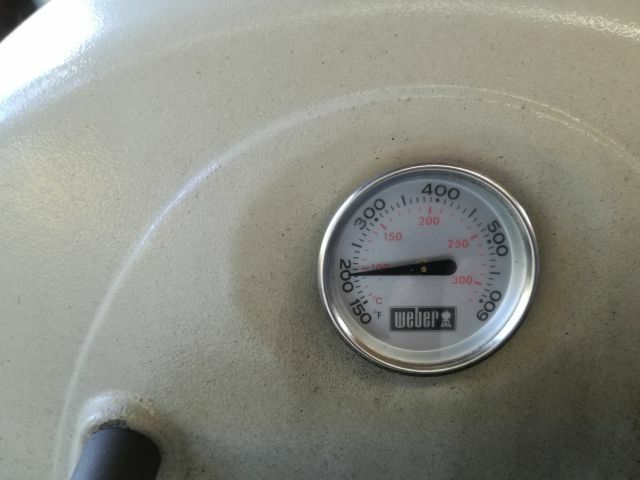 But recently, opportunity came along, by the kind offer of a friend who upgrades his Weber, and was looking for a new home for his Weber Q100, albeit, in non-working condition (“it doesn’t heat up properly”). This is the full view, including the stand, and a standard propane bottle already connected. 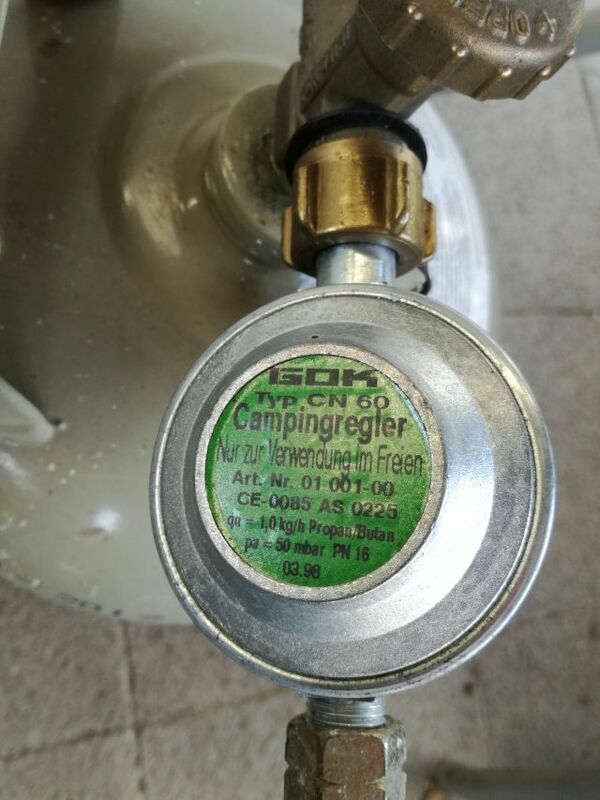 Based on the data of the Q100, no need to run on special Weber gas, or Weber gas cans. This is the gas regulator I am using, just ensure it is 50 mbar, and has about 1 kg/h max flow. That’s plenty for the Q100. 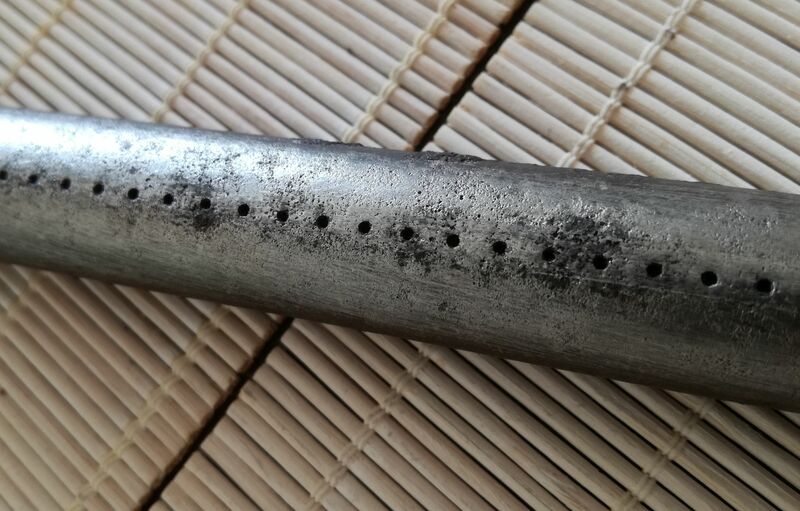 After 1st inspection, it is clear that the burner (stainless steel pipe in Q shape with many holes) is not in good condition. Several outlets blocked up. Usually, first recommendation is to scrub with a good stainless steel brush, WHILE the burner is in operation. This will burn away all grease and particles. Tried, but a bit too much residue to make this work. 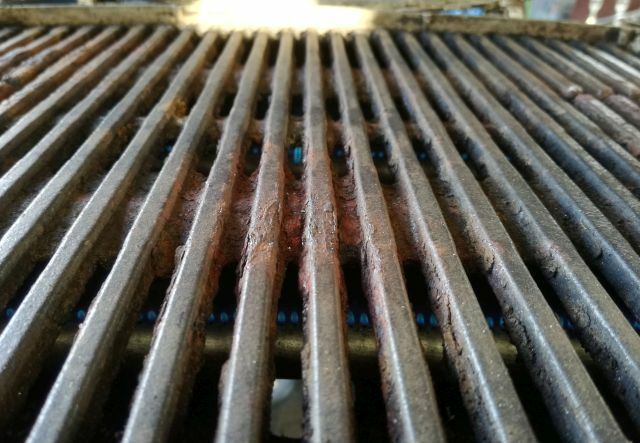 Replacing the burner – certainly, an option, but costly, and these Q burners appear to be in short supply as spares. (3) Clean inside, by knocking on it with a piece of wood (brown dust will fall out), and with any kind of small brush or wire you might have at hand. (4) Put in dishwasher to remove as much grease as possible, clean with some methylated spirits and/or acetone. If not properly de-greased, you will have trouble with the next step. (5) Check all the holes by using a 1 mm twist drill. 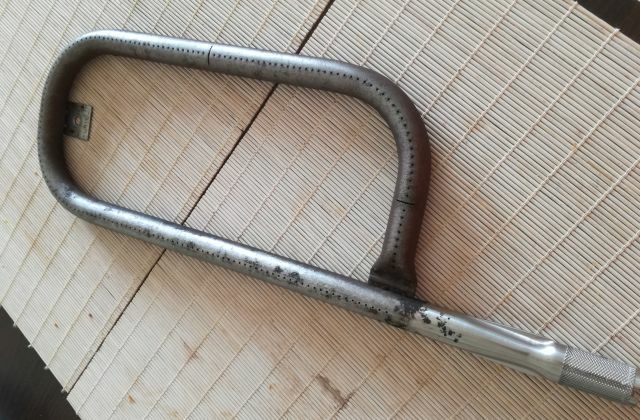 Make sure not to enlargen the holes but just to remove and solid residue. (6) Clean with pressurized air or similar. Also make sure to clean out the “venturi” section and wire mesh at the inlet. Mhh, still no good flame. Seems the Q100 is not getting enough gas. You need to check the orifice. (1) Remove the gas inlet unit (the assembly with the knob to regulate the gas flow, two screws). (2) Remove the orifice (which has a hex outside, usually, glued in with some Locktite). 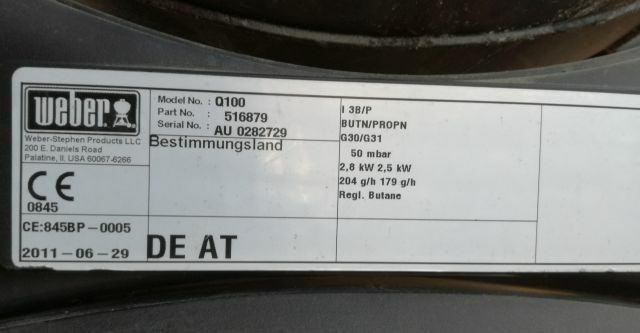 Don’t break any of the plastic parts. (3) Clean out the orifice with air. No wire! Check visually. To avoid blockage of the orifice, it is advisable to never connect a dirty gas pipe to the Q100 (some spiders might have crawled inside), and to cover the gas inlet of the Q100, if you need to remove the gas pipe for some reason. 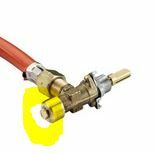 Best method is to leave the gas regulator and pipe/gas tube permanently connected. Now, after all this work, the Q100 is on flame again. All burning nice and blue. Just after a minute, already heating up quite a bit. Now we have to put it to a real test next weekend.